The global cryptocurrency market is anticipated to grow at a spectacular rate due to the rising demand for digital payments. Bitcoin leads the global market as it was first company to introduce digital currencies in the year 2009. Although Litecoin is expected to catch more attention during the forecast period due to the increased usage of cryptocurrency in users over the past few years. Other currencies such as Ripple, Namecoin, and Ethereum are also prominent in the market. Global investors are deciding on which currency will gain momentum in the cryptocurrency market globally. Increased use of blockchain technologies in finance are being implemented to create innovative products, enabling end-users to adopt cryptocurrencies. This will eventually lead to the growth of financial industry globally. 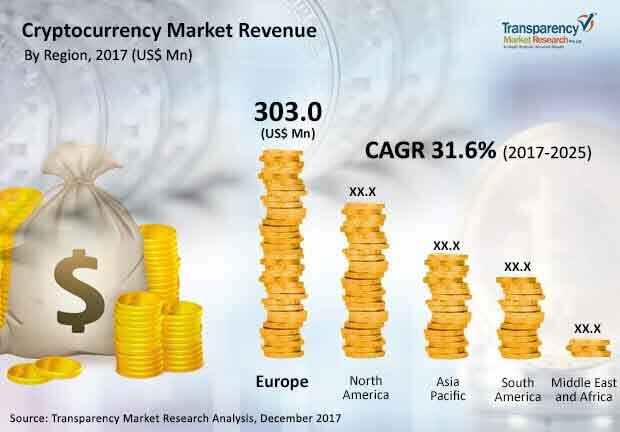 Some of the leading key players in cryptocurrency global market include BitGo, Xilinx Inc., BTL Group Ltd., Alphapoint Corp., Advanced Micro Devices, Inc., NVIDIA Corp., Intel Corp., BitFury Group Ltd., and Microsoft Corp. The global market for cryptocurrency was valued at US$574.3 mn in the year 2017 and is expected to be worth US$6702.1 mn by the end of 2025. The overall market is estimated to grow at a stellar CAGR of 31.3% during the assessment period 2017 to 2025. The market for cryptocurrency is segmented into software and hardware. The hardware segment is likely to dominate the global market during the forecast period. As per regions, the market for cryptocurremcy is fragmented into Europe, North America, Asia Pacific, and Latin America. Of these, Europe is estimated to account for the majority of market share throughout the forecast period due to the existence of numerous mining pool. North America is also likely to offer huge growth opportunities in the coming future. The crypgtocurrency market is gaining importance owing to the revolution in digital payment systems derived from blockchain technologies. The increasing need for secured and decentralized digital payments are responsible for rising demand of digital currencies. Some of the factors that drive the global market for cryptocurrencies include no third party involvement, minimal chances of fraud and theft, and zero transaction fees for digital currency exchange. In addition to this, there are other factors that promote the growth of cryptocurrency market which include transparency and persistence of the low ownership cost and the technology in distributed ledger. Also, with the high security offered by cryptography for digital currency transactions, makes these transactions inaccessible and thus builds trust among the parties involved in digital transactions. In spite of the rising demand for cryptocurrency market, there are some features that may hinder the overall growth. One of the major concerns related to cryptocurrency is the lack of awareness among people. Also, the lack of supervisory control on the transactions made has hampered the adoption of cryptocurrency market across the globe. Another concern towards this market is the price instability and internet security breaches impede market growth. Hence, there is a high risk involved while investing in cryptocurrencies. Nonetheless, there are some investors and companies who are spreading information to the common man about the awareness of investing in cryptocurrencies. This is expected to drive more demand for cryptocurrency market in the coming years.